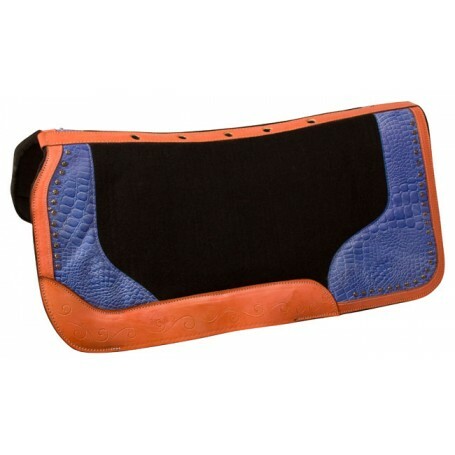 This beautiful black felt pad features blue alligator print accents that create an eye-catching look in the arena. Light oil leather wears with decorative line tooling and silver studded trim add appeal to the pad design. The pad reduces the risk of galling or rubbing while keeping the saddle in place. This pad will conform to your horse's back for optimum comfort within the first ride. The shock-absorbing felt wicks away moisture to keep your horse cool and comfortable throughout the ride. The two piece construction with a spine channel aids in cooling with ventilation holes along the spine.